ALL WELCOME: Parents of children with hearing loss, deaf and hard of hearing adults, and the professionals who serve them: Join us February 22nd, 2019 from 7:30am to 4:40 pm at St. Luke's United Methodist Church! Separate sessions designed specifically for Parents, Audiologists, Teachers of the Deaf, and Speech-Language Pathologists. In these extended learning sessions, participants will explore and discuss topics relevant to their field or family lives through the lens of their own experiences. Small groups of professionals will discuss objectives and discuss how they can apply them in their own schools, clinics, and practices. Facilitators will guide the parents and professionals to help them create a plan of action that they can apply in their own clinics and schools, and families. Do you work with students who are participating in general education settings? Do you wonder how you can best support them meet the ever-expanding linguistic, academic and social demands of a mainstream setting? Come to this session to learn how to determine the profile of potential of your students, and apply five guiding principles and essential practices of LSL intervention to enhance their learning. Coaching and guiding parents requires skills that are different from those required to teach children. Professional development includes acquisition of knowledge and expertise in adult learning styles and preferences as well as a variety of coaching strategies and techniques designed to empower parents as the primary teachers of their child. This presentation will up-level and advance the knowledge and abilities of participants coaching families of children who are deaf/hard of hearing in early intervention. Specifically, participants will engage in learning about Evocative Coaching (Tschannen-Moran, 2010), an approach that builds on existing strengths and incorporates the principles and practices of Appreciative Inquiry (Copperider, 2001; Orem & Binkert, 2007; White, 1996). This presentation will focus on creating a streamlined continuum of care to meet patients’ needs. Patients today work with many different professionals, and this session will discuss the importance of a collaborative approach to patient care. Attendees will learn how they can help patients successfully navigate transitions (e.g., from First Steps to preschool, from elementary to middle school, and from high school to college or careers). The profound impact of technology on the lives and identities of young deaf adults is explored in the Listening Project. Fourteen deaf people tell stories beginning with a childhood wide-eyed about sound, into the growing pains of adolescence and, eventually, their professional lives. Sometimes humorous, always tender, The Listening Project is a timely coming of age story, one we haven’t heard before. Guided Discussion to follow. This presentation will feature a research to practice format. Theory of Mind is the capacity to infer other people’s mental states, and to use this information to predict behavior. Information will apply to all children with an emphasis on children with hearing loss. Participants will take home strategies for "growing the child’s brain” for social-emotional enrichment and for the development of Theory of Mind. Along with the ability to clearly communicate needs, wants, thoughts, and opinions, the ability to apply, analyze, synthesize, evaluate, and create is equally important for college and/or career readiness. Students who are deaf or hard of hearing sometimes have difficulty engaging in these higher order-thinking skills. 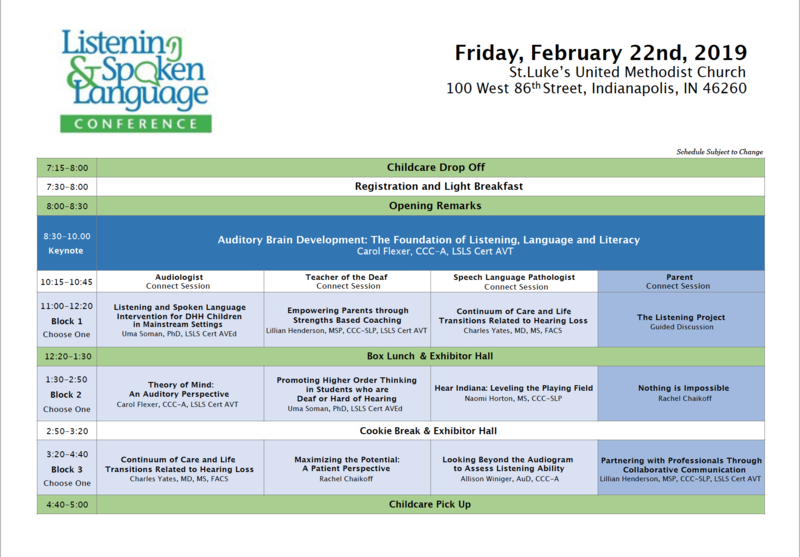 In this session, strategies and activities for developing higher order thinking skills, while developing listening and spoken language skills in an academic context will be discussed. Resources for developing activities will be shared. Some of Hear Indiana’s programs like special education advocacy, camp, and this conference are decades old, but others are quite new. Today we also offer spoken language therapy, pediatric audiology, and deaf education consultations. In this session you’ll learn more about ALL the programs and services that Hear Indiana offers to parents of children with hearing loss and the professionals who serve them. Join us to learn what Hear Indiana can do for you! Learn from a young adult who grew up with hearing loss about experiences living with Usher Syndrome and serving in the Peace Corps. Her Peace Corps service is not merely a travelogue of living abroad but also a story with important lessons about persons with disabilities having talents and so much to contribute to the world. She will provide tips for parents on how to empower their children with hearing loss to maximize their potential. Learn from a young adult who grew up with hearing loss about experiences living with Usher Syndrome. Rachel Chaikoff will provide tips for professionals including surgeons, therapists, and audiologists on working with patients. She will share stories of how professionals who worked with her helped her meet her fullest potential. While the audiogram is the standard metric used to denote hearing levels, it does not necessarily portray how a child will fare in the classroom. Many factors can influence the listening abilities of a child with hearing loss, such as classroom acoustics, noise, distance from the speaker, and the child’s ability to supplement missed auditory information. Tools such as Functional Listening Evaluations (FLEs) or a thoughtfully selected speech perception battery can provide valuable insight into a child’s real-life listening abilities. Parents of children who are deaf or hard of hearing have the unique position of having to effectively communicate with medical and educational providers while maintaining a positive working relationship. Using conflict resolution texts, Crucial Conversations: Tools for talking when stakes are high (Patterson, 2012) and Nonviolent Communication (Rosenberg, 2003), parents will identify when conflict resolutions skills are needed and be taught tools and strategies for collaborative communication with service providers.